With its never-ending space, nothing can prepare one for the vastness of the reserve nor its untouched, mystifying beauty. 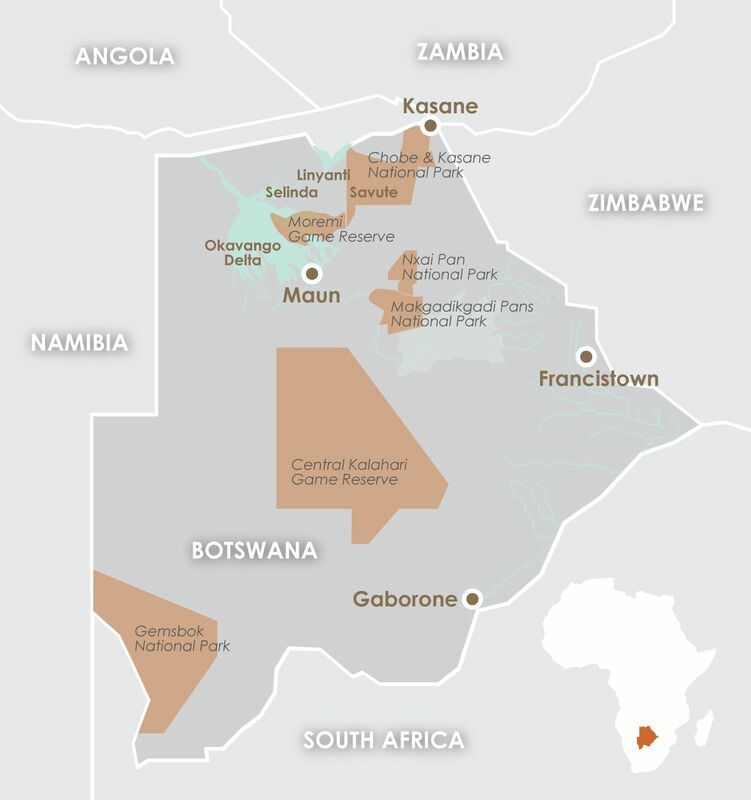 The Central Kalahari Game Reserve with its wide empty pans and flat earth offers its visitors the luxury of viewing an assortment of untouched nature and game. Wildlife to be seen includes giraffes, warthogs, wild dogs, brown hyenas, blue wildebeest, red hartebeest and an array of buck. Clear nights allow for stargazing, whilst its summer rains attract all to this remotely situated reserve. The northern Deception Valley with its sweet grass draws a huge concentration of herbivores who feed within this area. So do the predators, who tag along hoping to catch their next prey. The desert further has an assortment of fascinating reptiles, scorpions and insects to be viewed. For an all-round African experience, your trip can be guided by one of the original settlers to the area. The lodges generally hire Bushmen, who call the reserve home. They guide visitors into the desert and impart their survival knowledge onto those who wish to be informed. The Makgadikgadi Pan offers another distinctive experience for its viewers. Its vacant, flat and untouched terrains seem to stretch right into the milky blue horizon. The feeling that you have entered into a foreign land is undeniable. Little wildlife is able to exist during the harsh summer months. During the rainy season the pan becomes an essential habitat for migrating animals, especially the large zebra population. The grasslands that border the pan provide shelter to many reptile species, including tortoises, rock monitors, snakes and lizards. However, the most exciting part is, that the pan is home to the only breeding population of greater flamingos in Southern Africa. Visitors are gifted with the overwhelming spectacle of viewing hundreds of thousands of these gorgeous birds in a concentrated environment. The colour of these remarkable birds produces a strong contrast to the starkness of the pans surroundings. During the rainy season the pans are transformed into a powder blue lake, with its waters lapping against the shorelines and flowing over its pebble beaches. This allows travellers to gain an understanding of the extensive, pre- historic lake that the Makgadikgadi once was. The Nxai National Park is part of the larger Makgadikgadi Pans, which becomes the seasonal home for large herds of zebra. Once part of the ancient salt lakes, it now boasts large grass lands. These are scattered with islands of acacia trees and smaller pans that fill up with water during the rainy seasons. Even though wildlife viewing is seasonal, dependent on the rain, once all the animals migrate to this area, it is one that cannot be missed. The rainy season, generally between November and March, is said to be the best time to visit this extraordinary location. February to April provides visitors with the opportunity to view thousands of grazing animals on its grass plains. The dry season runs from May through to October. This time is not seen as ideal to visit the reserve, as the weather is harsh and wildlife sparse. The time to visit the pans varies depending on the experience one wishes to have. The actual pans are only accessible during the dry season from July to mid-October. However, the areas located on the northern parts of the pans can be visited throughout the year. Yet if one wishes to witness the annual migration, which is the second largest in Africa, January to March is the best choice. With its interestingly shaped baobab trees and beaches of rounded pebbles, the Kubu Island takes one back to a time before man. This rocky outcrop is situated near the south western shore of the Sowo Pan. It is littered with fossils, an indication of this prehistoric landmarks former water levels. Another highlight within this region is the Nata Sanctuary, which comprises of both pans and grasslands. This community based conservation project is situated in an extremely important environmentally sensitive area. During the rainy seasons when the pans fill up, visitors are treated to gorgeous displays of flamingos, pelicans, ducks and geese. An elevated hide adjacent to the river provides an unbeatable view of the pans. If one is looking for pleasant, reasonably priced camping facilities the Nata Sanctuary is the place to look.